Significantly damaged teeth are at risk of developing more problems. Broken and cracked teeth create easy avenues for plaque and bacteria to travel. This can develop into serious decay, gum disease, abscess, and other infections. Oral health problems require attention immediately. If you wait too long, problem teeth may need a root canal and, in the worst cases, tooth extraction. Better to address a damaged tooth as soon as possible, not only to restore the appearance of your tooth, but to safeguard your smile from breaking down even further and leading to unavoidable, invasive dental procedures. What Problems Do Dental Crowns Repair? Dental crowns cover a damaged tooth like a cap, hence their nickname, replacing original tooth enamel. The crown is carefully rendered in size, shape, color, and translucency so that it looks like a natural tooth that fits seamlessly into your smile. Crowns conceal any dental repairs that need to be made below the surface of a tooth, such as a root canal. With a crown in place, neighboring teeth are prevented from developing problems. And when damaged teeth have their strength and functionality restored, biting and chewing are easy again. A porcelain crown is also used in conjunction with a dental bridge, serving as anchors on either side of the bridge to hold it in place. The combination of these two restorations eliminate the hole in your smile and strengthen it at the same time. If you’ve ever seen someone with a tooth that sports a dark gray line near the gum, you are very likely looking at an old crown (you may even have one of these yourself). Older crowns were made with a great deal of metal and, over time, the metal begins to show through. Modern dental technology makes it possible for your Philadelphia dentists to give you a high-quality, natural-looking dental crown. The crowns are fabricated to reflect light like natural teeth, and there will never be a gray line peeking out from the crowns. The average lifespan of a dental crown is 10 to 20 years. When done properly, a dental crown will protect your natural tooth from needing retreatment. Your teeth will remain strong, healthy, and fully functional. 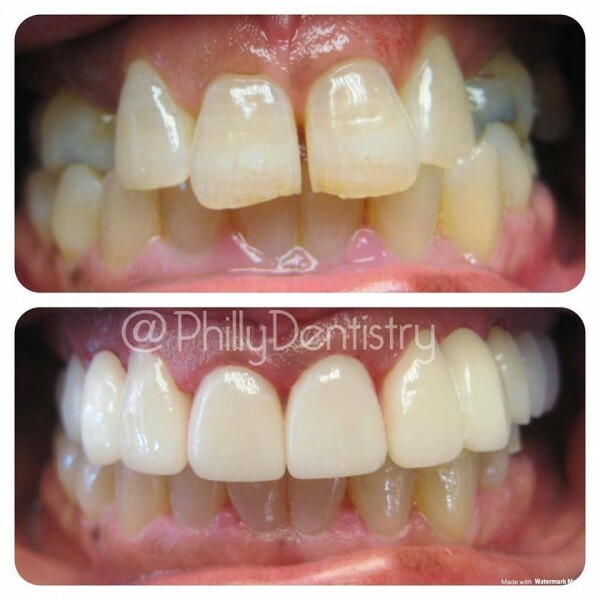 Protect your teeth against further decay and damage, cover up unsightly teeth, save your natural tooth, and complete your smile makeover with dental crowns from Philly Dentistry. A porcelain crown will restore your tooth to its original shape and size and eliminate any discomfort. Plus, you will feel confident about smiling again, knowing that your teeth look good. Make your appointment at our Philadelphia dental office with Dr. Cirka, Dr. Meier, Dr. Jeon or Dr. Smith to learn more about dental crowns and whether you are a candidate for this restorative dentistry procedure.